Neil and Sue Shay are Willamette Valley transplants from Florida who moved to Monroe in 2011. They renovated a property that was overgrown with Christmas trees and bluebirds. The couple had crafted hobby wines when they lived in Southern Michigan and had success with local contests. Neil was a food science professor who began work as a teacher and researcher at Oregon State University and also served as director of the Oregon Wine Institute. Sue had a background in sales and marketing and worked in that capacity for Airlie Winery and Heart of Willamette Valley wineries. Encouraged by the owners of Cardwell Hill, they jumped into the wine business as part of their "active retirement." 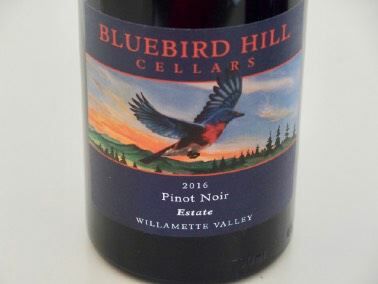 Bluebird Hill Cellars started small, with 214 cases released from the 2015 vintage. They sourced fruit from various wineries and enlisted the winemaking expertise of Bobby Moy. They now have a line of seven varietals including Pinot Noir, Pinot Gris and Chardonnay. Local artist Sky Evans painted the bluebird that graces the wine labels. A 1.5-acre vineyard has been planted on each side of the main house with tight spacing. A tasting room is located in the B&B.